One piece of advice I often give students and colleagues commencing a research project is to start with a research goal or question, but to let the archives guide your project. This advice reflects not only my commitment to empirically based research, but also my experience as a historian. Research projects are often refocused after hours of sorting through the dusty pages from the past when it becomes evident that there is scant archival material on a designated project. This does not mean abandoning the original project, but rather reformulating it to reflect the materials available to you. From James S. Dennis's A Sketch of the Syria Mission, 1872. Inside front cover. This scenario describes my primary research project on the history of women in the Protestant Church of Ottoman Syria (present day Lebanon and Syria) during the early to mid-19th century; a project I have been investigating at PHS and other research institutions for over a decade. The Syria Mission was formally established by missionaries for the American Board of Commissioners for Foreign Missions in 1823, but transferred to the Board of Foreign Missions of the Presbyterian Church in the U.S.A. in 1870. As I have described elsewhere, despite the strong emphasis placed on literacy by both the Syria Mission and the Syrian Protestant Church, there is a surprising dearth of material in the archives written by American missionary women and Syrian Protestant women, particularly during the first half of the 19th century. I have been lucky to find memoirs by Sarah Smith and Loanza Benton, as well as letters by Catherine DeForest and Lucinda Pease, at various research institutions. But the material for women pales in comparison to that of their male contemporaries, such as Eli Smith, Cornelius Van Dyck, Henry Harris Jessup, Butrus al-Bustani, and John Wortabet, as well as missionary women from later periods, such as Frances Irwin and Winifred Shannon, and the articles by Arab women printed in al-Nashra, the Arabic journal for the Protestant community, during the end of the 19th century, as studied by Deanna Womack. Undeterred by this hurdle, I took my own advice and reconfigured my project (while hoping that additional sources would eventually be made available). One way I did this was to investigate the places where mission women worked, raised their children, and were buried. Not only do those spaces provide the physical contexts in which women lived, but they also illuminate the roles women played in establishing new communities in Beirut and throughout the Levant. Records held by PHS have proved particularly useful in my study of Protestant spaces, particularly Record Groups 90, 115, and—most recently, as described by PHS Records Archivist David Staniunas—RG 492. From Henry Harris Jessup's Fifty-Three Years in Syria, 1910. Page 43. Consider the “Mission Compound” in Beirut, which can be explored through an interactive digital map. According to a series of deeds found in RG 115, box 4, folder 8, the Mission Compound sat on a plot of land outside of the old city walls. 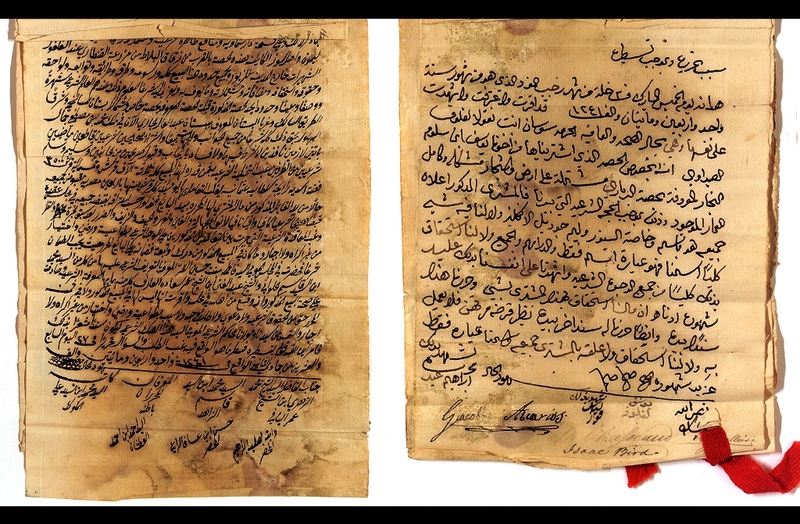 It was rented, piece by piece, between 1826 to 1832 by an early convert, Tannus al-Haddad and two women: Tannus’s wife Warda and the Protestant widow Susan Wortabet. One deed was for the garden where Pliny Fisk’s body was buried, a place that later became the “Mission Cemetery.” Another deed was for a building that became known as the “Mission House” or “Burj Bird” (tower of Bird) named after its second missionary inhabitants, Ann and Isaac Bird. Burj Bird was a multi-purpose space that housed numerous mission families, the mission church, the Native (National) Evangelical Church (est. 1848), the American Mission Press (transferred to Beirut in 1832), mission offices (including the office where the so-called “Van Dyck Bible” was translated), the boys seminary, the DeForest Female Seminary, and various prayer meetings. 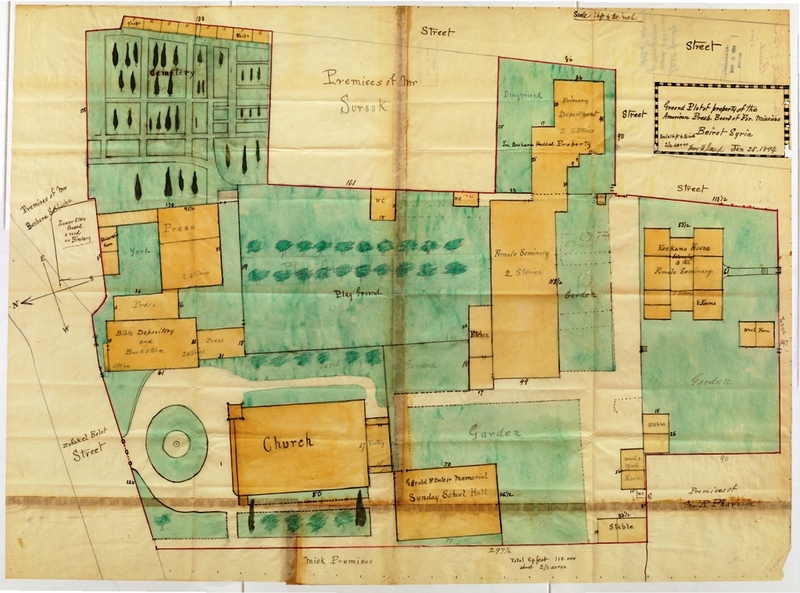 "Jessup map," Beirut Mission Compound, 1894. From RG 115, Box 4, Folder 11. Larger version. As the Protestant community expanded, so did the Mission Compound. Additional buildings were erected and adjacent land purchased, as indicated by a hand-drawn map by missionary Henry Harris Jessup found in RG 115, box 4, folder 11. 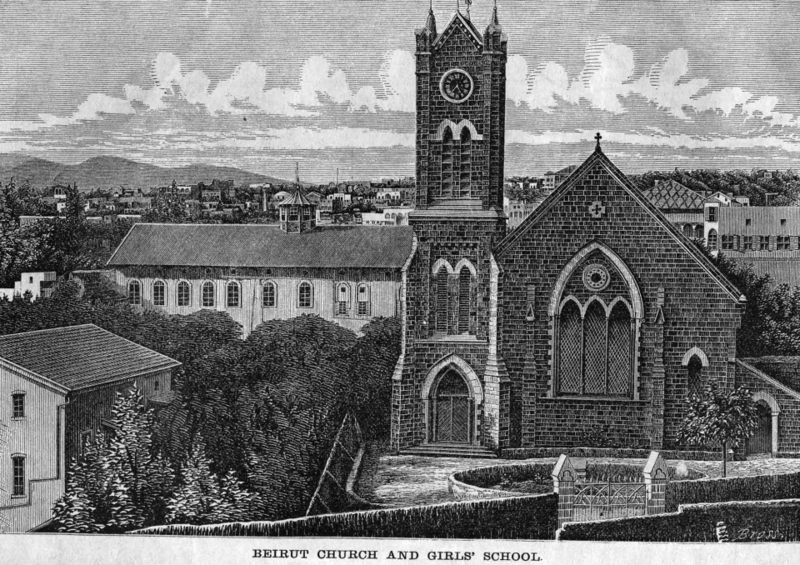 In 1835, a building was erected for a “Girls’ School” and Sunday school. 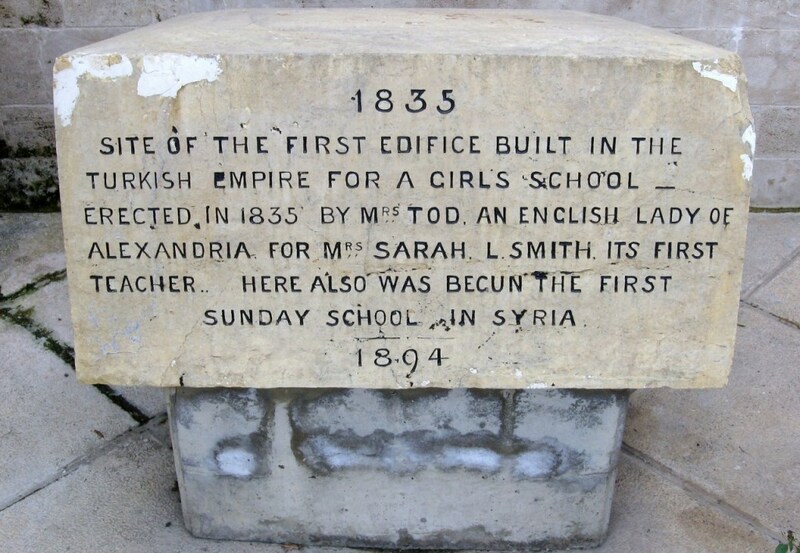 (This building is often erroneously regarded as the first school for girls in the Ottoman Empire, due to a misleading “memorial column” erected in 1894 to commemorate the death of one early scholar, Rahil Ata al-Bustani). 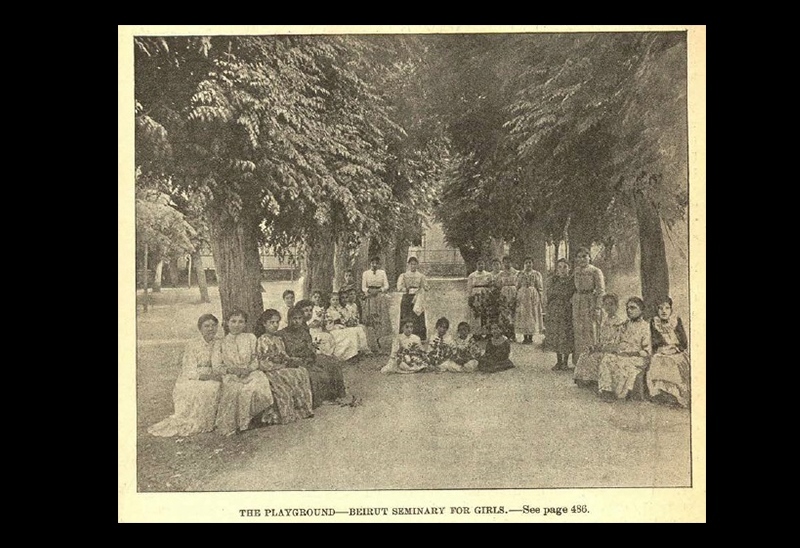 In 1866, Burj Bird was significantly renovated to function solely as the Beirut Female Seminary, later known as the American School for Girls, a prominent educational institution for girls in the region (now the Beirut Evangelical School for Girls and Boys). 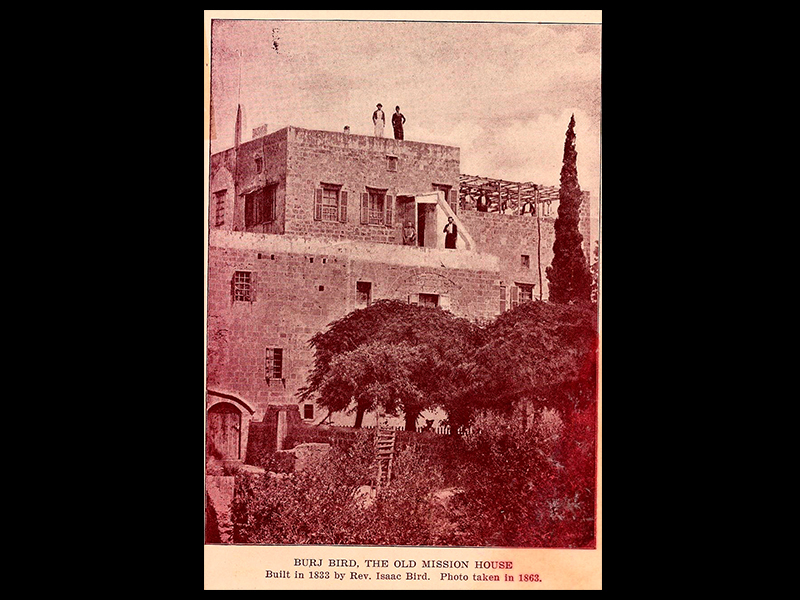 Upon the death of the aforementioned Warda al-Haddad in 1882, her family gifted a house along the eastern boundary to the Mission, which was named in her honor as “Im Beshara House,” or mother of Beshara (her son). This building was integrated into the Beirut Female Seminary. Additional buildings were also erected, including a gothic-style church built in 1867 at the north side of the compound for use by both the Anglo-American Church and the Native (National) Evangelical Church. The American Mission Press was housed in a separate building between the church and the cemetery, until its removal in 1922 to a prefabricated barn in an adjacent neighborhood. Base of Beirut Memorial Column. Photo by Christine B. Lindner, 2006. Missing from Jessup’s map are the additions at the turn of the century, which included a manse for the Arab pastor, a new building for the (male) Theological Seminary (now the Near East School of Theology), and houses for various missionary workers. Despite these additions, it can be argued that throughout the late 19th century until the early 20th century, the primary activity on the Mission Compound, at least during the week days, was the education of Syrian women, provided by American and Syrian teachers. Protestantism in Lebanon was significantly altered during the 20th century—changes that were reflected in the Mission Compound. As part of devolution (or “integration” as it was called in Lebanon and Syria), the deeds to the land and buildings of the Mission Compound were transferred in 1959 from the Presbyterian mission (then under the oversight of the Commission on Ecumenical Mission and Relations) to the local churches: the Congregational National Evangelical Union and the Presbyterian National Evangelical Synod of Syria and Lebanon. At the same time, the Lebanese government enacted an urban planning project that changed the eastern part of the compound. While the American School for Girls and former press buildings were demolished, the graves of the Mission Cemetery were transferred to the Anglo-American Cemetery in 1960. A diary by Henry Glockler found in RG 115, box 3, folder 17 not only records this removal process, but also the epitaphs for each grave, providing a unique record of the women and children who lived and died in Beirut—including people such as Melita Carabet who are often excluded from traditional histories. From The Church at Home and Abroad, 12:10, 1894. Page 493. The remaining buildings were severely damaged during the Lebanese Civil War from 1975 to 1990, when members of the Protestant church and mission were themselves in danger, as witnessed in the kidnapping of Benjamin Weir. Today, the only Mission Compound buildings that remain are the restored National Evangelical Church and the church offices, although the historic legacy of the space can be seen in the surviving clock tower and the base of the 1894 memorial column. History often centers on the most prominent figures, whose letters and books form the basis of archival collections and whose lives structure finding aids and research guides. But history is also shaped by those whose voices have been lost or never recorded. It is the job of the scholar, such as myself, to search for these voices, often by reinterpreting archival sources and re-envisioning research projects, in order to re-present the past in its fullest, and most revelatory, detail. Portions of deed signed by Isaac Bird and others, 1826. RG 115, box 4, folder 8. Larger version. Christine B. Lindner is a professor and historian of gender and the history of Middle Eastern, American, and European encounters. Her primary research focuses on the history of the Protestant Church in the Levant, specifically Lebanon. She served as the inaugural director of the Preserving Protestant Heritage in the Middle East project at the Near East School of Beirut (Lebanon), and has taught at the University of Balamand (Lebanon) and Philadelphia University. Dr. Lindner will take up a position of Assistant Professor of History at Murray State University in the Fall 2016 term. Ellen Fleischmann, “Evangelization or Education: American Protestant Missionaries, the American Board, and the Girls and Women of Syria (1830­­-1910),” in: H. Murre-van den Berg. (ed.). New Faith in Ancient Lands: Western Missions in the Middle East in the Nineteenth and early Twentieth Centuries. Leiden and Boston: Brill, 2006, 263-280. Ellen Fleischmann, “‘I only wish I had a home on this globe’: Transnational Biography and Dr. Mary Eddy,” Journal of Women’s History 21:3 (2009), 108-130. Ellen Fleischmann. “The Impact of American Protestant Missions in Lebanon on the Construction of Female Identity, c. 1860-1950,” Islam and Christian-Muslim Relations 13:4 (2002), 411-426. 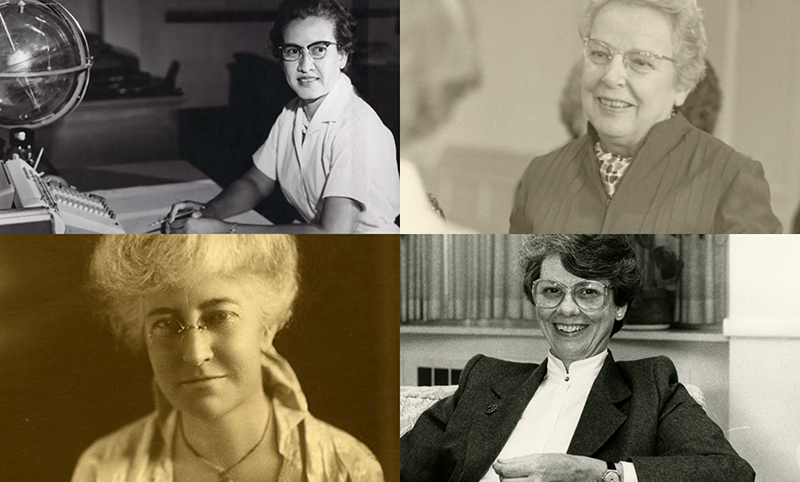 Ellen L. Fleischmann, “‘Under an American Roof’: The Beginnings of the American Junior College for Women in Beirut,” Arab Studies Journal (2009), 62-84. Henry Harris Jessup. The Women of the Arabs: With a Chapter for Children. (ed. C. S. Robinson and Isaac Riley). New York: Dodd & Mead, Publishers, 1873. Shereen Khairallah, The Sisters of Men: Lebanese Women in History. Beirut: The Institute for Women Studies In The Arab World, Lebanese American University, 1996. Christine Lindner, “The Flexibility of Home: Home and Family as Employed by the Missionaries in Ottoman Syria from 1823 to 1860,” in: M. A. Doğan and H. J. Sharkey. (eds.). American Missionaries and the Middle East: Foundational Encounters. Salt Lake City: University of Utah Press, 2011, 33-62. Christine B. Lindner, “‘Long, long will she be affectionately remembered’: Gender and the Memorialization of an American Female Missionary,” Mission and Social Sciences 23:1 (2010), 7-31. Christine B. Lindner, “‘Making a way into the heart of the people”: Women of the Early Protestant Church in Beirut,” Theological Review of the Near East School of Theology 32:2 (2011), 71-96. Christine B. Lindner, "Negotiating the Field: American Protestant Missionaries in Ottoman Syria, 1823-1860." Ph.D. thesis. Edinburgh, U.K.: Edinburgh University, 2009. https://www.era.lib.ed.ac.uk/handle/1842/3687. Jean Said Makdisi, Teta, Mother and Me: An Arab Woman’s Memoir. London: Saqi, 2005. Deanna Ferree Womack, “Conversion, Controversy, and Cultural Production: Syrian Protestants, American Missionaries, and the Arabic Press, ca. 1870-1915.” Ph.D. thesis. Princeton: Princeton Theological Seminary, 2015. Deanna Ferree Womack and Christine B. Lindner, “‘Pick up the pearls of knowledge and adorn ourselves with the jewelry of literature’: An analysis of three Arab women writers in al-Nashra al-Usbū‘iyya," in: Colin South et al, eds., Living Stones Yearbook 2014. London: Living Stones of the Holy Land Trust, 2014, 125-157. 14 hours 22 min ago. Today’s #HistoricalFigureFriday honors Reverend James Patriot Wilson. Born in 1769 in Lewes, Delaware Wilson went on to graduate from the University of Pennsylvania in 1788. He initially studied law and was admitted to the Bar but the unexpected death of both his wife and brother led him to a religious path. He was ordained as pastor of the Presbyterian Church in Lewes in 1804 and in 1806 he accepted a call to lead the First Presbyterian Church in Philadelphia. He resigned as a much celebrated pastor in the spring of 1830 before he died December 9th 1830. Our portrait of Reverend Wilson was painted in 1807 by none other than James Peale the younger brother of Charles Willson Peale. This oil on canvas painting represents one of the many large portraits James Peale completed after he shifted away from miniatures. To see more works by James Peale visit PAFA The Pennsylvania Academy of the Fine Arts or the Philadelphia Museum of Art.